together to serve their customers." Brautigam, Van Dyne, Manousos Flowers (BVM Florist) and Phillip's Flowers & Gifts recently announced they are joining forces. Both family-owned companies have proudly served the greater Chicago area for three generations from multiple flower shop locations. And, in the close-knit Chicago florist community, the two families have been friendly colleagues for years. But, according to BVM Florist owners Roine and Scott Michaels, "We decided to close our shop at 4555 N. Western Avenue in order to focus on some family care-giving needs." That prompted a difficult choice. Where should they refer their friends and long-time customers? "It was one of the most difficult decisions we had to make," said Roine. Any small business owner can appreciate the challenge. The Michaels had known many of their customers for years and wanted to be sure they would be in good hands. After all, florists design flowers for people's romances, birthdays, weddings, new babies, and a host of other happy occasions. They also serve families at times of mourning and grief. So, the ties that bind florists and their customers are naturally strong and personal. Jim Phillip, Chairman of Phillip's Flowers, agrees. "Roine and Scott are very dedicated to their customers, and that's a value we hold dear. So, it's really an honor and a privilege to be working with them, providing the kind of exceptional quality and service their customers expect." Phillip's operates ten award-winning flower shops delivering to Chicago and 150 suburbs daily. With seven full-time family members actively involved, the company also provides commercial interior plantscaping and holiday decorating services throughout Chicagoland. Phillip's is also one of only a few Chicago area florists with its own wholesale flowers company. So, it has a huge variety of fresh flowers daily from all over the world. 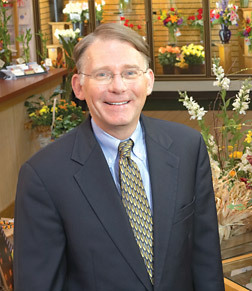 "Our resources are now all at the disposal of BVM Florist customers," said Phillip. With the Michaels still active in a consulting capacity, the two Chicago flower legends have simply become intertwined. In fact, the merger may be relatively transparent to many BVM customers, for whom Phillip's is already answering phone calls and delivering nationwide. According to Phillip, "Customers seem very happy with the transition, and now both flower families can continue to bloom where they're needed most." Perhaps that's what a family flower business is all about. For additional information, call Brautigam, Van Dyne, Manousos BVM Florist and Phillip's Flowers at 1-800-356-7257 and (773) 356-7257, or visit Phillip's Flowers online. Serving Chicago since 1923.